Dead Again is one of my favorite mystery thrillers. And guess what, folks? Why, it was released in that banner year for movies, 1991! The print media crowned Kenneth Branagh “the new Orson Welles” after Branagh adapted, directed, and starred in 1989’s Henry V. As his first film following that triumph, Dead Again was a big deal when it was first released in 1991. With Dead Again’s twisty plot turns, recriminations of guilt, and expressive, operatic camera movement, I think a more apt comparison for director/star Branagh would be to Alfred Hitchcock. Accepting the AFI Lifetime Achievement Award, Hitchcock famously quipped, “The best way to do it… is with scissors,” and it seems at times as if Dead Again screenwriter Scott Frank has internalized this famous bon mot about film editing – or at least uses it here as an inside joke. An insane amount of Dead Again involves various pairs of scissors. THE PLOT IN BRIEF: A mysterious, mute woman (Emma Thompson) shows up at an orphanage, seeking shelter and haunted by terrifying dreams. The priest in charge calls on private detective Mike Church (Kenneth Branagh), who places the woman’s photo and story in the newspaper, hoping that someone will step forward to “claim” her. Antiques dealer Franklyn Madson (Derek Jacobi) responds to the newspaper story and offers to hypnotize the woman to discover her identity. Madson has made hypnosis into a lucrative sideline – in the process of helping people to quit smoking or avoid chocolate, he exploits their past-life memories to find treasured antiques. Under hypnosis, the mysterious woman recounts the story of a famous Hollywood murder: Roman Strauss, a German composer, allegedly killed his young wife Katherine with a scissors. 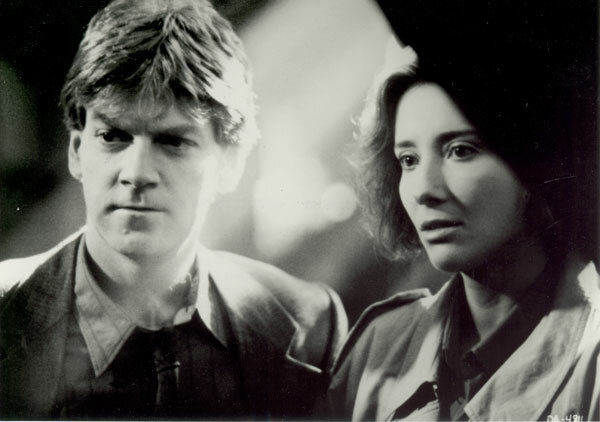 (Branagh and Thompson play Roman and Katherine in a series of flashbacks.) Is the mysterious woman the reincarnation of Katherine, hell bent on getting karmic revenge on the reincarnation of her murderous husband? Such an outrageous plot surely requires titanic amounts of suspension of disbelief on the part of the audience. I find it humorous that the film itself contains so many over-the-top explanations and lines of dialogue to help this process along. At one point Jacobi turns to Branagh and says, “It doesn’t matter what YOU believe. She is really having this experience.” Jacobi might as well be talking to the audience. At the time they were making Dead Again, Branagh and Thompson were married, and this film can be seen as Branagh’s love letter to his wife; she is photographed ravishingly throughout. In both the numerous black-and-white flashbacks and in the contemporary scenes, Emma Thompson has never looked this beautiful on film. Sadly, the couple divorced five years after Dead Again was released. AN ANNOYING AUTOBIOGRAPHICAL PAUSE: I was lucky enough to snag tickets to the Chicago premiere of Branagh’s Hamlet through a well-connected colleague. Branagh was in attendance at the screening. He was then going through his messy divorce from Thompson. (Earlier in the day, I told my freshman English class, studying Romeo and Juliet, that I might actually get to talk to Branagh that night and that he had played Romeo onstage several times; my students had a question for him.) After the screening, I approached Branagh in the lobby, introduced myself, and asked him my students’ question. He smiled, sighed, and said, “Thank you… for being the first person tonight… to NOT ask me anything about Emma Thompson!” He looked much tinier in person than he looks in the movies. In his impeccably tailored green suit, he looked a little like a leprechaun. The wonderful score is by Patrick Doyle (who, in cameo, can be spotted in an elevator playing a cop.) Doyle also scored Branagh’s Henry V, Much Ado About Nothing, Frankenstein, Hamlet, Love’s Labour’s Lost, and As You Like It. More recently he scored Harry Potter and the Goblet of Fire, Thor, Rise of the Planet of the Apes, and Brave. Doyle’s score for Dead Again is turgid and bombastic, all sweeping strings and percussive stings, as if the emotions onscreen cannot be confined to the screen and must burst into the audience via the auditorium’s speakers. Dead Again is chock-full of tricky plot twists and turns, and I am trying manfully here not to spoil anything. Seeing it again, I watched to check if the film “played fair” with the audience. I was actually amazed at the amount of subtle foreshadowing in the film’s first half. Frequent moviegoers and mystery lovers are usually good at guessing upcoming plot twists, but this film does a great job of misdirection. I defy readers of this column (during their first viewing of the film) to guess its terrific twists! “There are stories of coincidence and chance, of intersections and strange things told, and which is which, and who only knows? And we generally say, ‘Well, if that was in a movie, I wouldn't believe it.’ Someone's so-and-so met someone else's so-and-so and so on. And it is in the humble opinion of this narrator that strange things happen all the time. And so it goes, and so it goes. And the book says, ‘We may be through with the past, but the past ain't through with us.’"
Dead Again is available to purchase on DVD and to stream on Amazon Instant Video. YES, in a few short days we will be celebrating the year that was 1991. The Commitments – Though not for everyone, this terrific musical represents a hat trick of sorts for director Alan Parker, who also directed Bugsy Malone and Pink Floyd The Wall. The Dark Backward – Though not for everyone, this twisted black comedy features an engrossing performance by Judd Nelson as a stand-up comedian with an extra arm growing out of his back. SERIOUSLY. An extra arm. L.A. Story – Though not for everyone, this quiet comedy features a funny performance by screenwriter Steve Martin… and a great “coffee ordering” scene. Night on Earth – Though not for everyone, this mixed bag of an anthology film features the only watchable Roberto Benigni performance ever recorded. Once Around – Though not for everyone, this incisive comedy/drama features one of Richard Dreyfuss’s best performances. See this one with friends, and an argument will ensue about whether Dreyfuss’s character is a great guy or a world-record jackass. The Rapture – Though NOT FOR EVERYONE, this apocalyptic drama features Mimi Roger’s best-ever performance. One has to admire the gutsy ending; this film does not play it safe. See you all on the Twitter (which, as I understand it, is a series of Twubes) Saturday afternoon for the Second Annual F This Movie Fest! I will be the one with the scissors sticking out of my chest. Funny - I remember watching this movie some time in the early 90s, likely shortly after it came out even though I was but a "Tween" (ugh) - the ONLY thing I actually remember about it is scissors. Haven't thought about this movie EVER, but seeing the poster and reading you article, I just see a pair of scissors in no context whatsoever - I guess whatever they were going for in that regard worked on me, even if NOTHING else stuck. I'll have to give it another watch. Sol, I had the exact same experience - ALL I remembered was scissors! Rewatching it again recently was great, because the twiscriptiness was still able to surprise and delight. I think JB is right on with his take about the art direction and Branaugh's directing. For me, this movie is an intentionally over-the-top homage to the classic Hollywood style -- with all of the affection for its tropes and energy, but none of the winky-wink ironic distance. I love Dead Again. Your review touches on everything I would want to say about it. Great performances by Derek Jacobi, Robin Williams and Andy Garcia too. Great that you mention The Dark Backward, JB. That's a film that's not seen or talked about enough. Bill Paxton's performance is 'commited'. The DVD comes with a commentary by director Adam Rifkin and Paxton, which is definitely worth your time. But, as you say, it's not for everyone. My mom took me to see Dead Again when I was probably too young to appreciate it and I still loved it. At the time, I don't think I knew any of the actors, save for Andy Garcia and Robin Williams. I haven't seen it in years, and reading this makes me want to watch it again. 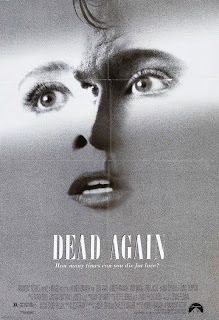 "Dead Again" is right up there for me with "Shattered" (w/Tom Berenger) and "Deceived" (w/Goldie Hawn)...both from 1991. Kenneth just knew how to photograph Emma. She looks amazing in "Much Ado About Nothing" and "Peter's Friends" too, in different ways. The flashbacks were conceived to always be in black and white but to cover their butts, Branagh filmed them in color. When test audiences were confused, it was the perfect excuse to sell the flashbacks in their black and white form.